1 of 1 Heat oven to 325 F. Wrap outside of an 8-1/2- or 9-inch springform pan with foil. Find a roasting pan that is large enough to hold springform pan. Set aside. 1 of 1 Place cookie crumbs in a medium-size bowl. Stir in butter and salt until evenly combined. Pat into bottom of prepared pan (cover your hand with plastic wrap to keep crumbs from sticking). Place pan in roasting pan. 1 of 4 Coarsely chop chocolate. Place in a medium-size microwave safe bowl; microwave on HIGH power for 1 minute. Stir until smooth. Set aside. 2 of 4 With an electric mixer, beat cheese, sugar and cornstarch in a large bowl until creamy, about 2 minutes. Add eggs, one at a time, beating well after each addition; scrape down side of bowl occasionally. Beat in sour cream and vanilla. Blend 3 cups batter into the melted chocolate, stirring until smooth. 3 of 4 Dollop both kinds of batter over crust. 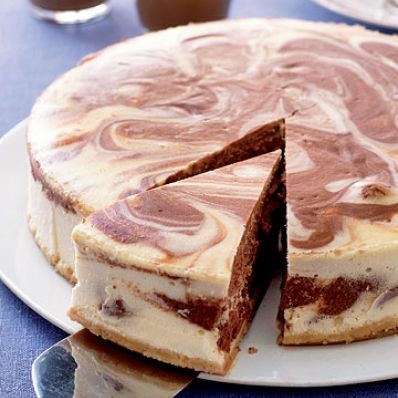 Using a knife, swirl batters together to marbleize. Transfer to 325 F oven. Pour hot water into roasting pan to come halfway up side of springform. 4 of 4 Bake at 325 F for 1 hour, 10 minutes, until set. Remove cheesecake from water; remove foil. Run knife around edge of cake. Cool on rack. Refrigerate, uncovered, for 6 hours or overnight. Per Serving: 15 g sat. fat, 27 g Fat, total, 113 mg chol., 209 mg sodium, 5 g pro., 24 g carb., 0 g fiber, 355 kcal cal.